After celebrating a long winter, partying your year’s fill on Christmas and New Year, when it’s time to wake up afresh in the warm air of a refreshing and active springtime, the residuals of the unchecked fun season needs to flush out of your system and so does the clutter and grime of your home space. Most people we know seem to share a love-hate relationship with cleaning. When the party's over and friends are all gone, who volunteer happily to doing the dishes, anyone? Probably none, because cleaning can be most tedious. Unless, you find the right inspiration and know how to fun things up! We won’t judge you if you are having a hard time coming out from your snuggly winter mode. That time of the year when it feels so good under the warm sheets that you never want to come out. However, when the sun’s finally up bright and the Xmas holidays have long past, you need to break the sleepy spell and come back into action. Throw open your windows into the first spring sun and twist into the Bharadvaja's Pose, breathe in all the good energies of a bright new season. This seated spinal turn wrings out the spine, broadens the shoulders, and de-tangles the pelvic joints. Do the twist also for massaging out your inner organs and make digestive juices flow. Nothing like a good twist to make your spirits charge. After you have dusted the rust off your spinal system, it’s time to get your alignment back in place. The long holiday of lazing about the house will probably leave you lax in the spine and back, how would you get back to your active routine like that? Interchange your spinal posture between the Cat and the Cow Pose to relieve stress and re-establish alignment between the neck, spine, and hips. Raise your neck high, curving your spine concavely as your perform marjaryasana, and convexly by dropping your head hanging low in bitilasana. Repeat the flow in and out of the two for ten times. Enjoy the fluid movement. The Bridge Pose is a classic prolonged backbend that also comes with enormous chest-opening benefits for expanded breath. Poets say the spring air is rife with good vibes and flagrantly fresh as daisies and full of brewing romance. You need to work your lungs out of torpidity and revel in the fragrant air with this pose. Besides, an established practice of the Bridge Pose can make your arms and shoulders stronger, create good muscular flexibility, and activate the nerve centers. The posture has great benefits for combatting depression with an instant outpour of serotonin, working like a tonic on the blue days of end-of-the-season melancholic contemplations. Stress alleviation, detox, and core posture alignment are addressed with the complete package that is Salabhasana. While you might be still coming out of your unchecked diet and lazing around over the winter merriment, Salabhasana restores your body balance and posture. Be shipshape for summer with strength built in the spine, buttocks, arms, and legs. Enjoy the active stretch-back and send your breath to the fatigued areas. Make sure you warm up before taking on this pose because it could be intense. Balasana is the ultimate pose to get comfortable and let breath do its magic. All about slow exhales, restfulness, and deep stretch-outs, Balasana is relaxing as it is restorative. If you do not wish to start your spring anxious and tightened in the muscles, nestling in the Child’s Pose should be on the cards. Feel the calm spreading through your brain as you lie with the weight of the thighs and lowered body pushed on your shoulders and your forehead touched to the ground. Plan out the year ahead as a calming rush of blood veins through the inner works of your brain. You know what can absolutely mar the joy of spring? A backed up colon with acute flatulence! Tailored to wind-release and restore comfort in the abdomen, Pawanmuktasana is for the mornings-after of the winter party-days when you are feeling just too clogged up to go out and enjoy in the sun. Allow your breath to travel inside your belly and chest, creating a natural pressure for wind release. Now that you have successfully circulated oxygenated blood into your tissues, woken up your lazed inner systems, activated the nerve centers, and detoxed from winter sluggishness, let the effects settle. Drop to the mat and lie down relaxed in savasana. Place a few bundled up blankets and pillows in appropriate places to make your rest effortless and fulfilling. Call your mind to a happy place and nestle in the ensuing peace. 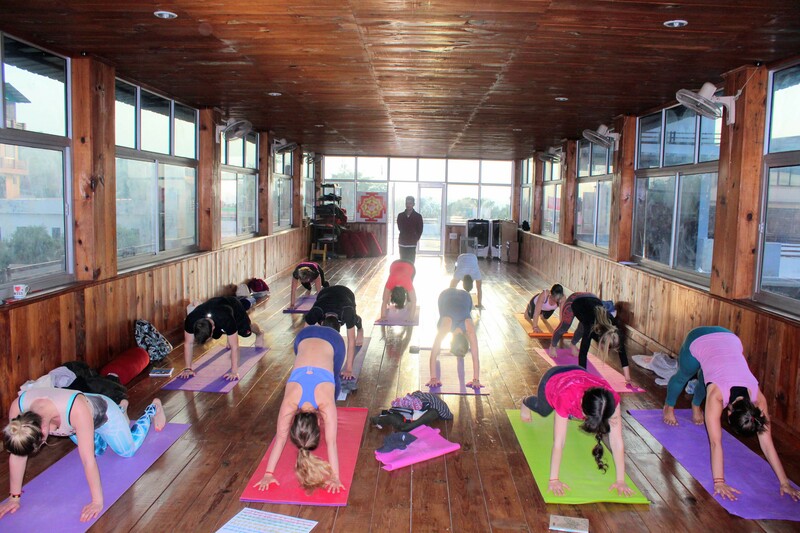 Wash your spirits clean with yoga as you enlighten your mind this spring during a Yoga Teacher Training in India.